The significance of this milestone is that BNI is the world’s largest business networking organisation with over 180,000 members worldwide who have passed more than $8.6 billion of business in the last 12 months. BNI is represented in more than 60 countries and operates on a business philosophy of ‘Givers Gain’ – by giving business to others, you will get business in return. Through structured meetings and ongoing training, members of BNI are actively encouraged to build relationships and find each other business. By entering the BNI Hall of Fame, BNI Sunrise is now in the elite top 1% of networking groups worldwide. BNI Sunrise meets every week for a 90 minute breakfast meeting at Villa Park where business professionals come together to talk about their business, educate other members about the type of business they are looking for, and to pass business referrals. There are 51 different professions represented in the group and these include a Shopfitter, IT Specialist, Electrician, Financial Adviser, Accountant, Event Organiser, Insurance Broker etc. All these professions work together with the aim of supporting each other and finding business. Lisa Gregory, the Chapter Director of BNI Sunrise said, ‘There is a real sense of camaraderie and support in this group. We take the time to get to know each others’ businesses and then we look out for opportunities. This has led to some very big contracts being passed between the members. I’m delighted that we’ve entered the BNI Hall of Fame and it’s testament to how we all work together so well. 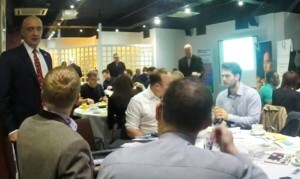 Peter Higgs, Executive Director of BNI Birmingham and Coventry added, ‘This is a fantastic achievement for BNI Sunrise. The group should be proud of their success and the fact that they are regarded as one of the top networking groups in the world. BNI Sunrise will be having a special meeting on the 8th October at Villa Park to celebrate their achievement. The meeting will include awards and, for the very first time, will be streamed live on YouTube. BNI is the world’s oldest, largest and most successful business networking organisation. BNI is currently represented in more than 60 countries and there are over 500 chapters in the UK and Ireland alone with more than 12,500 members. BNI Sunrise meets every week for a 90 minute breakfast meeting where qualified business referrals are passed between the group’s members. BNI was originally founded by networking expert Dr Ivan Misner in the USA in the mid 1980s. Ivan Misner is a New York Times best selling author and internationally acclaimed thought leader on all aspects of business networking and referral generation.